Dawn Mission Google+ Hangout: Ceres Series: Icy World Revealed? Britney Schmidt (Georgia Institute of Technology) and Julie Castillo-Rogez (Jet Propulsion Laboratory) will discuss Ceres, a class of solar system objects that haven’t yet been explored in depth, and how those explorations have the potential to change our concept of early solar system formation. We are predicting that Ceres is a dirt-covered icy world which will tell us about processes that operate in the early solar system, where, for a long time, most scientists thought ice didn’t exist. Destination Ceres: Icy World Revealed? 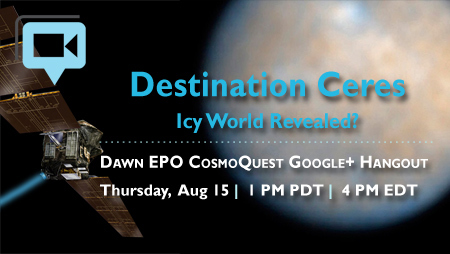 Join the Dawn EPO CosmoQuest Google+ Hangout to learn more! This entry was posted in Education and Public Outreach and tagged Ceres, Dawn, Google+ hangout, ice, mission, NASA on 2013-08-15 by Heather Dalton.